Upscale 100 Room Avalon Hotel New York City in Midtown is Sold. Domain Properties continues to represent Private Investment Entities, Pension Funds, REIT's, Hotel Management Companies, Asset Management Firms and Sovereign Funds in search of equity rich quality hotel properties in NYC. 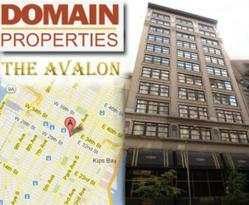 Domain Properties announced today that the firm has closed on the sale of the Avalon, midtown luxury hotel located at 16 East 32nd Street New York, NY 10016. Haim Yagen, Domain's principal represented seller and buyer. The upscale four star, 100 large rooms, 12-story, 71,250-square-feet building is a unique property in a prime midtown location. The property was managed by Vincci Hotel Management prior to the acquisition. Domain Properties has been actively engaged in representation of Hotel Portfolios for Sellers and Buyers of OFF-MARKET Hotel properties including Operating Hotels, Hotel Development Sites and Hotel Conversion Sites, including Luxury Hotels, Trophy Hotels, Upscale Hotels, Branded Hotels, Select Hotels and Boutique Hotels in New York City and beyond. To have Domain Properties represent your Hotel or Hotel portfolio or For complete OFF-MARKET listings of hotels for sale in New York City, please go to http://www.Domain-Properties.com. For a complimentary valuation of your hotel, email us Hotels(at)Domain-Properties(dot)com call 212-741-9700.